Jim Milledge has just completed a memoir entitled "Mountains My Lab". Although not intended for publication, Jim has given us permission to reproduce extracts on our blog. Each month during 2019 we'll bring you images and text that describe the life of one of mountain medicine's leading figures. Jim has been involved in high altitude medicine and physiology since serving as a member of Sir Edmund Hillary's "Silver Hut" Expedition in 1960-61. He started hill walking as a boy in North Wales and began rock climbing as a medical student. A 3-year commission in the RAF (in lieu of National Service) gave him a taste of aviation medicine. Training in respiratory medicine subsequently followed and experience in lung function testing led to a life long interest in respiratory physiology. After the Silver Hut, Jim spent 10 years as physician and physiologist at CMC Vellore, India, during which time he had two further expeditions to Nepal and a year spent as research fellow in San Francisco with John Severinghaus. On return to the UK in 1972 he was appointed to Northwick Park Hospital's Clinical Research Centre as a Consultant Physician and a Medical Research Centre (MRC) Scientific Member. He was able to continue altitude research at intervals, mainly on expeditions to the great ranges of Nepal, China, Kenya and throughout South America. In 1981 he was a member of the American Medical Research Expedition to Everest (AMREE) led by John West. For the last 4 years of his time at Northwick Park Hospital he served as Medical Director. He retired in 1995 and has been able to continue to pursue this interest in Mountain Medicine, almost full time! With two friends from the Silver Hut (John West and Mike Ward) he published the standard text on the subject, High Altitude Medicine and Physiology, now in its 5th edition. He has written and lectured widely on the subject and is involved with many altitude research groups in the UK. He was a founder member of Medex (Medical Expeditions) and a faculty member of the Diploma in Mountain Medicine. In 2005 he was made an Honorary Professor at University College London. 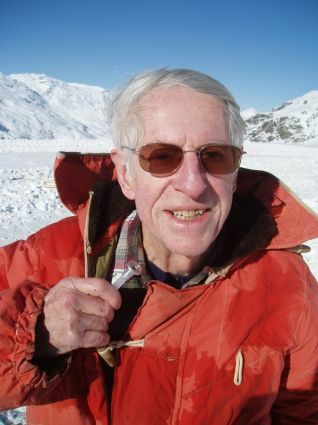 In 2007 he was the "Honoree" at Lake Louise Hypoxia Symposium and was President of the International Society of Mountain Medicine between 2004 and 2008. Aunty Nansi used to say, “Jim was born on holiday and has been on holiday ever since!” I was to have been born in Tianjin, a big industrial city in North China, in September 1930 after my parents had finished their seaside holiday at Bai Dai Hu but wishing not to miss out, I arrived a month early. My father, Geoffrey was a medical missionary with the London Missionary Society. His father had been an ordained missionary in Madagascar and my father was born there in 1904. However, my grandfather died when Dad was only four and he, his mother and elder sister came back to England. Later his mother returned after a few years to teach in the mission girls’ school in Antananarivo, as she had done before her marriage. In the 1919 influenza epidemic, his sister died and just after he qualified in medicine at Edinburgh, his mother died of cancer. They and a couple of maiden aunts brought him up mainly in his maternal grandparents home in London. My father’s maternal grandfather, James Sibree, after whom I was named, was a well-known missionary and polymath who served in Madagascar for 50 years. He was principal of the Theological College in Antananarivo and a prolific writer in both English and Malagasy. He originally went out to Madagascar in 1863 as a Master Builder on a three-year contract, to build four churches in memory of Malagasy Christian martyrs. He had to clear the sites, quarry the stone, teach the masons to dress the stones and supervise the building as well as design the churches. He also leant the language, preached and taught Sunday school! He completed two churches, built most of a third and made preparations for the fourth. On coming home he went to College, was ordained and returned with his bride to Madagascar for the rest of his working life. He died a year before I was born, having been knocked down crossing a road leaving the British Museum where he was still working on a book at the age of 93. James Sibree and family. May, my paternal Grandmother (left) and Aunt Elsie (right). My mother, Miriam was one of four children of Gwilym and Annie Thomas. Gwilym hailed from Bargoed, South Wales. His father was a smallholder and he had seven brothers and one sister (or, as he used to say with a twinkle in his eye, “seven brothers and a sister each”). He left school at 12, as was usual in those days and got a job in a grocery store. However, he couldn’t reach the top shelves and was sent home “to grow a bit more”! Later he gained entry to Bala-Bangor Theological College in North Wales and his first church was a small Congregational chapel in Arthog, a village across the estuary from Barmouth. Here he met and married Annie Roberts, daughter of a local farmer. 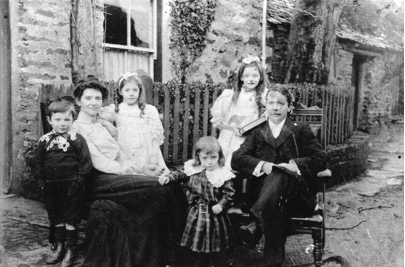 The Thomas family (from left to right) Emrys, Annie Thomas, Nansi, Alun, Miriam and Gwilym Thomas. Arthog, c1910. My mother’s elder sister was Nansi. Both girls were musical and became teachers. There were two younger brothers, Emrys and Alun who both became doctors. Emrys was in Edinburgh and was responsible for introducing my father and his friend of school and university, Greville Young, to his sisters. Greville and Nansi soon fell in love and became engaged. 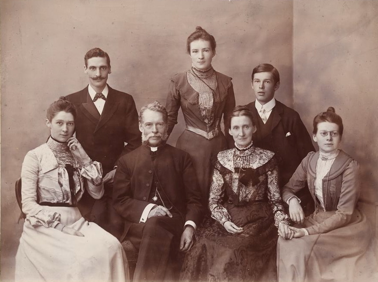 Greville’s parents were missionaries in India and Greville was sent out there as a medical missionary. Nansi followed and they were married in Calcutta. After the classical romantic hiccups, Geoff and Miriam got it together and followed suit up the aisle but in their case the wedding was in Cuckfield, Sussex, where Grandpa was by then the minister of the Congregational Church. On their way back from a short honeymoon on my father’s motorbike, they had a bad accident, which could have ended their lives there and then. They were due to sail for China in a week or two and Grandpa Thomas had to pack for them under their direction. In the next extract we'll hear about Jim's childhood in China.